Once upon a time, in a deep and dark forest, in the Bluegrass state of Kentucky, not far from the village of Edmonton, stood a psychedelic shack where the only rock and roll band in Metcalfe County rehearsed. The year was 1968, and the band was called Itchy Brother. The shack was really a farmhouse now known as the infamous Practice House. And the deep and dark forest was a place on Richard and Fred Young's family farm. Together, with cousins Anthony Kenney and Greg Martin, armed with a pickup-truck load of amps, drums, and guitars, and a stack of American and English rock records, they set out to conquer the world by creating their own brand of rock and roll. As the years went by, they made good on their promise to each other, and the record companies came. First, from Cincinnati, then Atlanta and Macon, Georgia, California, New York, and England, but something always stopped them from leaving the rock club circuit and becoming a national recording act. Presidential elections, plane crashes, the death of a record executive and disco, but most of all, their ages. The train hauling the heyday of Southern rock had come and gone. Itchy Brother got caught in the changing of the guard. They never got to ride the train, but they never gave up. In the early 80s, we started to hang out in Nashville. Because it wasn't known as one of the rock and roll cities, we had always avoided it like the plague. Our only bout with Nashville was a TV show called Young Country, said Richard Young. Itchy Brother played Robert Johnson's Crossroads on the show in 1970 and though it was fun. "It opened our eyes and pointed our hearts in a different direction," he recalls. Nashville was only 85 miles from Edmonton, but it seemed a million miles from where we started. Greg, then Fred, later took jobs as sidemen where their Southern rock skills proved to be handy and exciting to those acts who wanted to follow in the footsteps of Charlie Daniels and Hank Williams, Jr. Richard took a different route by hanging around writing houses. In 1981, with the help of their longtime friend and manager, Mitchell Fox, the boys were signed as writers to Acuff/Rose Publishing Company. Nashville didn't know it, but there was a roots movement starting to happen, and the "No Depression Era" was just over the hill. "It was during this time that we learned a lot about the music business and that Nashville was really only three streets wide," said Fred Young. In 1986, Greg introduced Richard and Fred to Doug Phelps. Prior to this, the plan had been to record an Itchy Brother album and go for it again, but Anthony declined. Doug Phelps was asked to join in Anthony's place. We couldn't see using the Itchy Brother name without Anthony. At the time, I was reading a book called Deep Blues by Robert Palmer. It spoke about the head chopping ritual and the fact that Muddy Waters band was nicknamed the Headhunters. I told the other guys about the story and it struck a nerve with all of us, said Greg Martin. The HeadHunters started rehearsing in March of 1986 in Greg's basement, then moved to the Practice House when the weather warmed up. "We were determined to create a whole new sound just like Itchy Brother had in the 70s. I knew there was a true passion from the first rehearsal and the fact that the other three were relatives, and had spent their whole lives playing together, made it like a fast-drying glue. For me, it was magic from day one," said Doug Phelps. The mid-to-late 80s were very special. If you go back and look at the musical diversity going on, especially the roots and college music scene, even country music was allowing things to happen. Their guards were down. This spilled over into the local scene around here. Bowling Green, KY, Louisville, and Nashville were all hopping, as well as the rest of the country. This had a huge impact on us and helped fuel the formation of the HeadHunters, observed Greg. "We are who we are and that's what makes us what we have become. From our life experiences and how we approach and interpret music is how we became a band that tells real life stories. We are a band of many styles: rock, blues, country, jazz, bluegrass, rockabilly, and other roots music. That is the foundation of our sound. Johnnie Johnson once told me "Music has no color. If I had to color the HeadHunters, I'd color us music with a feeling. says Fred. "It started to gel from the first rehearsal. When you can't put a label on it, even when you create it, you know you've got something special," says Richard. Doug had a brother who also loved music. Ricky Phelps was a wandering soul, West Coast-type folkie who had a knack for bluegrass and a love of the Beatles. "He had moved to Nashville to try his hand as a country songwriter/performer, and like the rest of us, wasn't having much luck. I suggested he should ride up to Kentucky with me and jam with our band, the HeadHunters, for kicks," says Doug. together with our rock and roll music, the room literally went neon," observed Richard. "Ricky joined the band, and the very next month, we had a great opportunity presented to us to record in Acuff/Rose''s Hickory Records Studio. They were literally dismantling the studio around us, but we still managed to record a demo of Walk Softly, Dumas Walker and Oh Lonesome Me, the latter being in recognition of all the help Wesley Rose had been to Richard over the years. After that, we started playing more and more gigs locally, but it was really our live radio broadcast, The Chitlin' Show, on WLOC in Munfordville, KY, and the Practice House that brought it all together," remembers Greg. In the earlier part of 1988, the HeadHunters met a very interesting fellow by the name of Jonathan D. W. Lyle. He was a huge blues music fan and fell in love with the HeadHunters music. He had a history of helping struggling bands, and ended up giving us $4,500 to go into the studio and record our music. We booked time at the Sound Shop with Mike Bradley and had just enough money to record for three days. We recorded eight tracks and called it Pickin' On Nashville, Doug remembers. uglas Corner, a local Nashville hangout. "Lee Roy Parnell was showcasing that night and we were a last minute tag on. After Lee Roy played, we sat up and kicked off with Walk Softly on this Heart of Mine. It was like someone had said there's a bomb in this place! The room cleared out in about two minutes, except for the sound man, waitresses, Tom, Larry, Harold Shedd and a few hangers-on," remembers Richard. "Lee Roy later told us that when he heard us that night, he thought, 'Oh my God, Heavy Metal Bluegrass!'" Greg recalls. Harold was the President of Mercury Records and had a reputation and success record for taking chances on the unlikely. He called us the next day and said we may be cooking hamburgers next year, but I've got to try this. The HeadHunters signed with Mercury in July of 1989. We added the Kentucky part of our name at this point, because Herbie Hancock was already using it as a stand alone. Pickin' On Nashville came out in October 1989. It blew up like an atom bomb, and changed our lives forever. The rest is history. Well, almost, says Richard. After the release of the HeadHunters' second album Electric Barnyard, all hell broke loose. On June 2, 1992, Doug and Ricky Phelps left to start a duo career. Longtime friend and cousin Anthony Kenney came to their rescue to play bass, and buddy Mark Orr was recruited for vocals. "It felt good to have Anthony back in the band, and we were proud to have a great blues rock singer like Mark Orr," say Fred, Richard, and Greg. Mark should have been one of those great Southern rock singers of the early 70s, but he missed the boat because of Vietnam. "When we were listening to the Beatles White Album in the Practice House, Mark was fighting on Hamburger Hill with the 101st Airborne Division," says Fred. During this time, the Kentucky HeadHunters returned to their blues-rock roots. They released two albums in 1993. The first entitled Rave On, on Mercury, and the critically acclaimed blues record That'll Work on Elektra-Nonesuch, with legendary blues pianist and Rock and Roll Hall of Fame inductee Johnnie Johnson. "Recording and playing with Johnnie Johnson has been one of the highlights of our musical journey. He was like your old uncle, laid-back and cool offstage, but when he sat down at the piano, he was in charge and anyone who ever played with him became a better musician." said Richard Young. In 1994 and 1995, there were a lot of changes in store for the HeadHunters. Mark Orr left the band, Harold Shedd left Mercury, Luke Lewis came in as president and, during this time, Mercury released a greatest hits package called Still Pickin. "When Mark left, I called the Phelps boys and asked if they would like to make another go of it. You gotta love Ricky. He said "! *?^* yeah! Let's change the name and start all over!" Now the HeadHunters have big balls, but I don't think anyone (including Doug) wanted to risk losing the HeadHunters brand," says Richard. In the end, it was Doug who came back. He has and always will be our friend, band mate, and a team player. Ricky will always be our friend, and we love him for who he is. 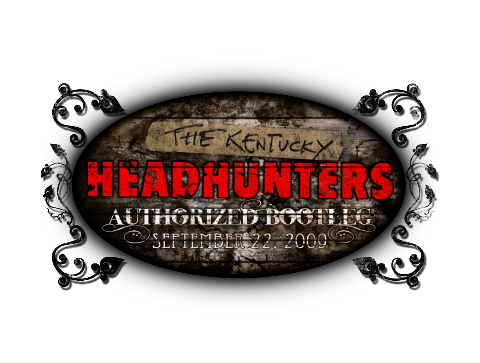 In 1996, the HeadHunters were signed by Joe Galante at BNA in Nashville after hearing what they had been up to since Doug's return. "Joe had always liked the HeadHunters and he had us record a song for Roy Roger's last album early on. We will never forget him for that opportunity," said Fred. The BNA record was called Stompin' Grounds. It was a trek back to the HeadHunters more country roots. Joe heard the record in his office and signed us on the spot. To set it up at radio, he and Connie Bradley at ASCAP got us on the New Faces Show. In 1989, we had blown the roof off of the place. We didn't get the same reaction the second time around. "When we kicked in, it reminded us of Douglas Corner in 1988. If the doors had been locked, those radio folks would have knocked them down to get out! Joe walked up at the end and said "Boys, that's one of the best shows I've ever seen. What a class act!" In 2000 and 2003, the HeadHunters came back with two of their best ever. Grass String Ranch was a rebel rouser's dream that saw the band dig deep into their Southern rock bag of tricks. Then came Soul, lauded by many to be the Heads at their best since Pickin' On Nashville and That'll Work. The record was an experiment to re-create the vibe, sound, and style of the early Muscle Shoals recordings. Once again, the rub of being from Kentucky created something all together different. Both records were on Koch Records. 2005 saw the release of Big Boss Man. Sony music's Tom Long called us and asked if we would take the Sony catalog and "HeadHunterize" a bunch of classics for movie tracks. Once they heard it, they put it out as a record. "We had a lot of fun messing with all those old songs, and it was great working with Tom, who was first to discover our talents back in the 70s," said Fred. In 2006, Flying Under the Radar was released. "This CD was a mixture of album cuts that we hoped would get a second chance to be heard, from the previous three CD releases. We're glad we put the record out. A lot of folks come up and say, "Oh, I like this song or I like that song." That's proof that if you put a great song on a record when the times and the way people are thinking are off, it will go right over their heads," said Doug. 2007 saw our cousin, and life-long bandmate, Anthony Kenney retire from the Kentucky HeadHunters. Anthony is truly one of the greatest musicians and songwriters we have had the honor to share the stage with. We will always miss his talent and quick wit. Fred, Doug, Greg and Richard found themselves right where they were when the HeadHunters started... A four piece band. They made a pact with each other that this was the way the Heads would stay. Back in 1990, a landmark live album was recorded, at the legendary Agora Ballroom, in Cleveland, Ohio. While the heads were writing on a new album, they decided to also use this time dust off the live multi-tracks, mix them, and present them to Universal Records. Luke Lewis heard the concert, made a call to California, and in 2009, the album was released on the prestigious "Live Bootleg Series," that had previously spawned great live albums from the likes of Muddy Waters, Kiss, Cinderella, and many others. 2010 saw The Kentucky HeadHunters take two giant and much needed steps. Finally, after many years of recording in large studio's, for major labels, the boys formed their own record label, "Practice House Records," and headed to the farm to record, for the first time in the "Practice House." The result was "Dixie Lullabies," released October 19, 2011. Being in the old farm house with no restrictions and no time limits allowed the Heads to be themselves, in the truest form. For an inside look at this adventure, Google "Kentucky HeadHunters epk". The Kentucky HeadHunters are currently working on two exciting new album projects. Stay tuned.. You know this bunch is pretty unpredictable. !